Great post! I agree with basically all of your picks, though I’m a bit doubtful about Kate Winslet for Lead Actress… not that she doesn’t deserve it, but it’s going to be steep competition with Meryl Streep, Sally Hawkins, Melissa Leo, and Anne Hathaway. One of my favorite films of the year which, imo, has almost a 0% chance of being nominated for Best Picture is WALL-E. Though it completely deserves to be in the discussion for Best Picture, simply because it’s an animated feature it won’t be acknowledged. That being said, I applaud your boldness in picking your Oscar winners well before the nominations have even been announced. You’ve nailed the front-runners, though a lot can change from now until February. 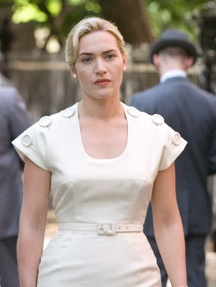 From what I hear, Winslet will win, but not for Revolutionary Road, it will be for The Reader. I don’t care who wins best pic, as long as Australia and freakin’ Benjamin Buttons don’t get noms. I agree Winslet is very tenuous for Best Actress; it’s not her strongest performance. But I’ve seen the others you mentioned and, while they’re decent, I don’t think they’ll win (Hawkins probably won’t even be nominated; I think Angelina Jolie will get the fifth spot). So I had to pick one and I think it’s Winslet’s time. I loved WALL-E, too. It has something most of the contenders don’t—a big heart. You and I have similar taste! I like all those movies you listed a lot—NOTHING BUT THE TRUTH really surprised me, especially that ending—but I don’t think they’re Best Picture quality. I love hearing about other people’s favorites—thanks for throwing in your vote for WALL-E, too, Shelley! I totally agree with you on Sean Penn’s performance in “Milk”. As for me, I would love “Ive loved you so long” to get an award (best foreign film or best actress for Kristin Scott Thomas), it’s a very clever and sensitive movie and Scott Thomas is amazing in it. I would also be glad if some posthumous prize was awarded to late lamented Heath Ledger. Am I the only one to have been thrilled with the stifling atmosphere of “Blindness” (starring Julianne Moore, Mark Ruffalo and Gael Garcia Bernal)?! Oh, and one of my best surprises this year was the wonderful independent movie “The visitor” by Thomas MacCarthy with a great performance from Richard Jenkins (usually cast for supporting roles).